Rain Dish The Pokémon gradually recovers HP in rain. This Pokemon regains 1/16 its max HP every turn during Rain Dance. Own Tempo* Prevents the Pok�mon from becoming confused. This Pokemon cannot become Confused. Emerald This POK�MON lives in ponds with clean water. 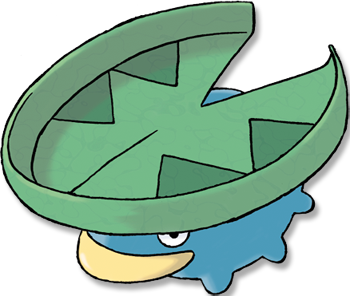 It is known to ferry small POK�MON across ponds by carrying them on the broad leaf on its head. Leaf Green It searches about for clean water. If it does not drink water for too long, the leaf on its head wilts. Diamond/Pearl It looks like an aquatic plant and serves as a ferry to Pok�mon that can�t swim. Platinum It looks like an aquatic plant and serves as a ferry to Pok�mon that can�t swim. Heart Gold Its leaf grew too large for it to live on land. That is how it began to live floating in the water. Soul Silver Its leaf grew too large for it to live on land. That is how it began to live floating in the water. Black It looks like an aquatic plant and serves as a ferry to Pok�mon that can't swim. White It looks like an aquatic plant and serves as a ferry to Pok�mon that can't swim.